I'm going back to childhood here. 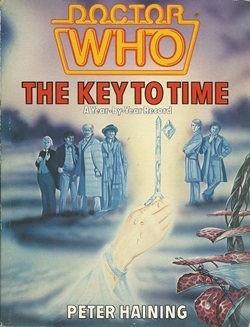 It has to be The Key to Time. I pored over this for hour after hour as a youngster. Though I have to admit I haven't read it for a long time. It suited the fact hungry seeker of more DW I was then. Doctor Who: The Companions also helped fill the gaps I was missing. This seems harsh. I see all the good things about the book but it just doesn't interest me enough. It's The Writer's Tale. I think it's a wonderful resource for fans who want to know the nitty gritty of the new show. I don't really care enough about RTD's era for this to pull me in. For other writers out there I think it's a wonderful resource. I'm not slagging this book off just saying it isn't for me. I enjoyed The Writer's Tale. It confirmed a lot of my prejudices but also enlightened me on a few things. It's not one I'll read a lot but the paperback edition, with 300 extra pages bringing it right up date was the better buy.